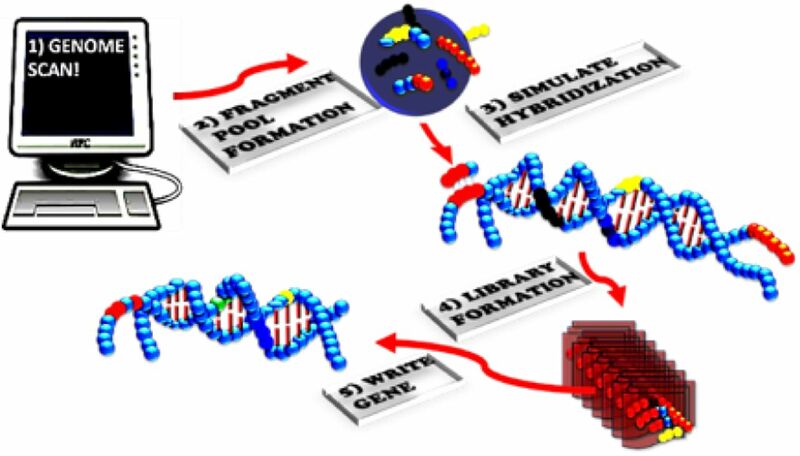 The ability to write DNA code from scratch will allow for the discovery of new and interesting chemistries as well as allowing the rewiring of cell signal pathways. Herein, we have utilized synthetic evolution artificial intelligence (SYN-AI) to intelligently design a set of 14-3-3 docking genes. SYN-AI engineers synthetic genes utilizing a parental gene as an evolution template. Wherein, evolution is fast forwarded by transforming template gene sequences to DNA secondary and tertiary codes based upon gene hierarchical structural levels. The DNA secondary code allows identification of genomic building blocks across an orthologous sequence space comprising multiple genomes. Where, the DNA tertiary code allows engineering of super secondary structures. SYN-AI constructed a library of 10 million genes that was reduced to three structurally functional 14-3-3 docking genes by applying natural selection protocols. Synthetic protein identity was verified utilizing Clustal Omega sequence alignments and Phylogeny.fr phylogenetic analysis. Wherein, we were able to confirm three-dimensional structure utilizing I-TASSER and protein ligand interactions utilizing COACH and Cofactor. Conservation of allosteric communications were confirmed utilizing elastic and anisotropic network models. Whereby, we utilized elNemo and ANM2.1 to confirm conservation of the 14-3-3 ζ amphipathic groove. Notably, to the best of our knowledge, we report the first 14-3-3 docking genes to be written from scratch.